There is a section in each child's profile called "Immunizations." This can be found under My School > Students; you would click on a child's name and scroll past the authorized pickup list section. Schools have the option to enable or disable the immunization section within each child's profile. The button to do this is highlighted in red above. For each child, you will need to enter the dates for when the immunizations took place manually. You can also upload any documents relating to immunization records using the Upload Document button. This will not automatically fill in the dates, but is a good way to organize and keep track of the child's paper records. NOTE: At this point in time, we do not have the ability to notify admins when a shot is coming up or due. 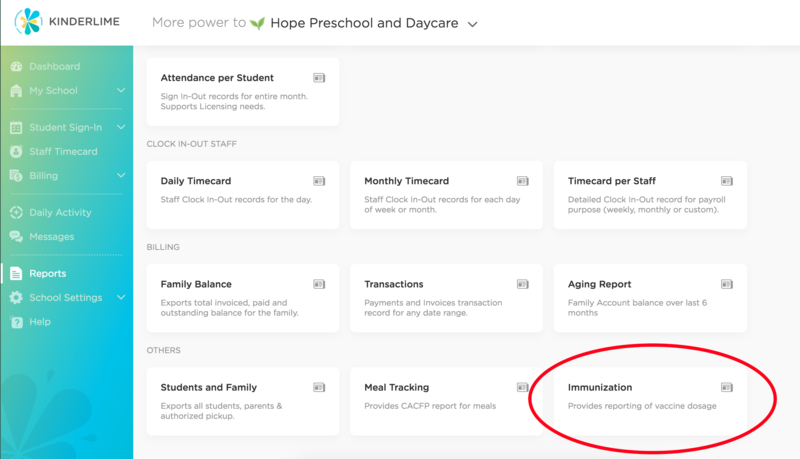 You can go to the Reports section of the website in order to pull an Immunization Report, which will show all recorded dates for children within a specific room, or all rooms of the school. The report can be found at the bottom of the Reports page of the website in the "Others" section.